There are so many great Munich attractions you’d have to move here to have a chance of seeing them all. Museums? Got ‘em in spades. Did you want once covering art, history, science or beer? There are palaces, parks, sports stadiums and statues, circuses, studios and squares. Witty and insightful reviews of things to see in Munich really the heart and soul of this website. So pull up a chair and get comfortable, you're about to go on tour. 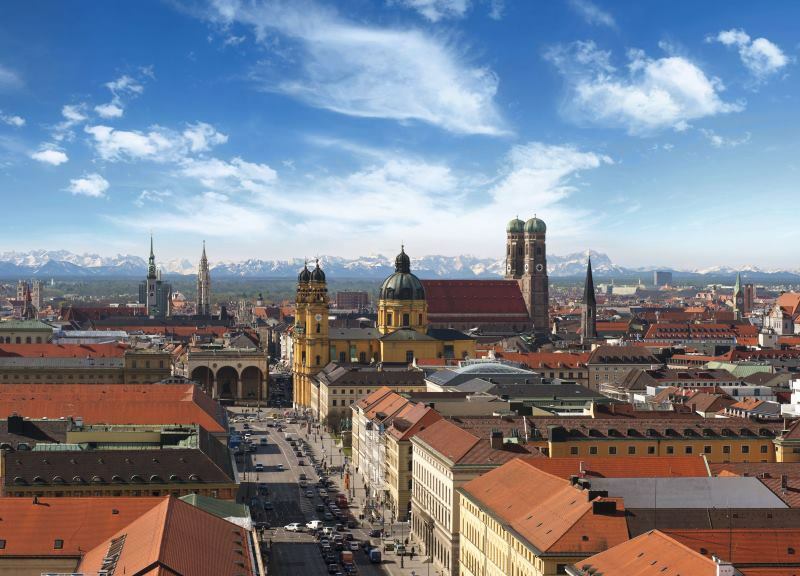 • A Munich self-guided walking tour - a self-guided schnell! schnell! walking tour of Munich. See the best the city has to offer in just two hours. I've placed an interactive map showing these areas and marking al of the attractions covered on this page here Map of Munich Attractions. Check it out, it's pretty cool. There are over 50 sites reviewed making this the most comprehensive (and the grooviest!) guide to Munich tourist attractions on the web. Munich’s three remaining city gates serve as bookends to the southern part of Altstadt (Old City). This is where a group of monks founded a settlement over 850 years ago which eventually gradually grew into the metropolis we know today. Munich’s main shopping axis runs from Karlsplatz (Stachus) with its Karlstor gate to the west, all the way through the Isartor gate in the east. Things to see in between include Marienplatz, the Viktualienmarkt market and the mighty Frauenkirche church. Another pre-eminent shopping strip runs south towards the Sendlinger Tor, another old city gate. ▪ Marienplatz - Munich's belly button. The city's central square. ▪ Frauenkirche - The Devil lurks within Muncih's greatest church. ▪ Hunting and Fishing Museum The dying art of taxidermy. Pomp and grandeur abound in the northern section of the Altstadt. This was the powerbase of Munich’s high and mighty, defined by the former imperial palace, the Residenz and its forerunner the Alter Hof. Other grand as gold attractions include the Hofgarten, Odeonsplatz with its adjutant Field Marshall’s Hall and the National Theatre. On the other side of the cultural spectrum sits the world’s most famous watering hole, the Hofbräuhaus. ▪ Munich Residenz - The jewel in the city's crown. ▪ Hofbrauhaus - Where Munich meets the world for a beer. ▪Odeonsplatz - Taste Italy in Munich at this Florentine square. Schwabing is to Munich what Soho is to London or Greenwich Village is to New York – or at least it used to be. Up to the 20th century it was little more than a village on Munich’s northern outskirts where the well-to-do kept mansions within easy reach of the Englischer Garten. Then it became a haven for artists and the avant-garde and ground zero for Munich’s communist uprising of 1919. It’s remained the city’s most trendy address and despite a gradual gentrification that’s pushed housing prices through the roof. The Ludwig-Maximilian University (LMU) and a thriving pub scene help to keep the area somewhat in the scope of the common folk. For an ideal Munich afternoon stroll down the main drag of Ludwig/Leopold Strasse before sauntering over east to the Englischer Garten, the world’s largest city park. Then hit the bars as the sun goes down for a few lively cocktails. ▪ The Englischer Garten - Splendor in the grass at the city's park. ▪ LMU (Munich’s Ludwig Maximilian University) - Top of the class. ▪ White Rose Museum - A plance to learn and remember the anti-Nazi resistance group that was centred around LMU in the Second World War. ▪ Siegestor Built for victory, destroyed by war, urging peace. Munich’s artistic treasures rival Paris or London – no kidding. The greatest concentration of museums and art galleries is in the Kunstareal in the Maxvorstadt, just north of the Main Train Station. King Ludwig I first ticked the public’s artistic senses here. He envisaged the area as a "forum of art", building Greek temple style museums on Königsplatz and two art galleries, the Pinakotheks, nearby. A third, the Pinakothek der Moderne, was added in 2002 to pick up where Ludwig left off. Another highlight is the Lenbachhaus Art Gallery, a brilliant mustard-yellow villa featuring artists from the edgy Blaue Reiter (Blue Riders) group which stirred up sensibilities from 1911 to 1914. ▪ Konigsplatz - The Grecian square with many faces. ▪ The Munich Documentation Centre for the History of National Socialism - The anatomy of terror. ▪ Neue Pinakothek - A world-class collection. ▪ Pinakothek der Moderne - Cutting-edge art on display. To see another round-up of sites to visit in Munich's Kunstareal, see The Art District. The mighty Isar River flows all the way from the Bavarian Alps and right through the heart of Munich. Most of the attractions along the Isar can be found between the Deutsches Museum (itself on an island in the river) and the Lutipoldbrücke (Lutipold Bridge) further north. Visitors usually stick to the west bank because that’s where the Old Town is, but there’s no lack of things to do and see across the water in the increasingly trendy suburb of Haidhausen. East bank highlights include the fortress-like cultural complex Gasteig, the venerable Müllersches Volksbad swimming pool and the stylish Villa Stuck art gallery. Party people will want to check out the clubbing scene at the Kultfrabrik and Optimolwerke, a haven of over 40 pubs and clubs near the Ostbahnhof S-Bahn station. A couple of wacky little museums can be found around the Isartor, including the Beer and Oktoberfest Museum and the Valentin-Karlstadt Musäum. Munich’s golden shopping mile, Maximilian Strasse, reaches across the river to the Maximilianeum (Bavarian parliament) on the east bank. ▪ Deutsches Museum - The mad scientist of museums. ▪ Angel of Peace - Golden girls calls for peace and love. To see another round-up of sites to visit along the River isar in Munich, check out the page Along the Isar. On your bikes! There’s plenty more to see out the city centre, and much of it can’t be ignored. What would a trip to Munich be without soaking up the glory of Nymphenburg Palace, for example? It’s about four kilometres west of the Main Train Station, near the Botanical Gardens and Europe’s biggest beer garden, the Hirschgarten. North of the centre lies the Olympic Park and the BMW complex, further out still, Allianz Arena and Dachau Concentration Camp Memorial. South west of the centre starts the idyllic Fünf Seen Land (Five Lakes District) full of great day-tripping opportunities. ▪ Nymphenburg Palace - Summer retreat for royals. ▪ BMW Welt and Museum - Rolling sculptures. ▪ Dachau Concentration Camp Memorial - Lessons. • Jump back to Destination Munich Home.